Rob Goffee and Gareth Jones argue that leaders don't become great by aspiring to a list of universal character traits. Rather, effective leaders are authentic: they deploy individual strengths to engage followers' hearts, minds, and souls. Authentic leaders are skillful at consistently being themselves, even as they alter their behavior to respond effectively to changing contexts. 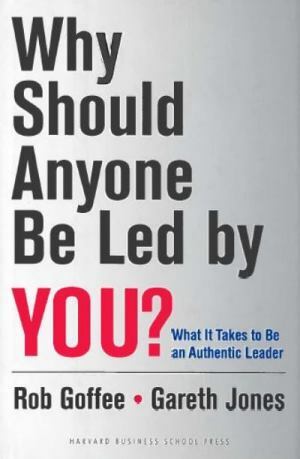 In short, the authors present a powerful case: that it takes being yourself, in context, with skill to be a successful, authentic leader--and they show you how to do exactly that. In this lively and practical book, Goffee and Jones draw from extensive research to reveal how to hone and deploy your unique leadership assets while managing the inherent tensions at the heart of successful leadership: when to show emotion and when to withhold it, how to get close to followers while maintaining an appropriate role distance, and maintaining your individuality while conforming enough to gain traction and lead change. Underscoring the inherently social nature of leadership, the book also explores how leaders can stay attuned to the needs and expectations of followers. Why Should Anyone Be Led by You? will forever change how we view, develop, and practice the art of leadership, wherever we live and work.